Sa Bom Nim Kachevas was born in Dubuque, Iowa, and graduated from the University of Iowa with a Bachelor of Arts in Social Work in 1974. After graduation, she moved to Santa Barbara, California and began her training under Sa Bom Nim Jeong Sook Lee on April 5, 1976. While in Santa Barbara, she became Master Lee’s first female blue belt. In 1979, she worked as an Assistant Instructor at J.S. Lee’s International Martial Arts and Fitness Center in Seattle, Washington. Sa Bom Nim Kachevas moved to Lakewood, Ohio and opened the Korean Karate Center, SE 149, on July 2, 1980. Her 2nd Dan promotion followed in October 1982 and she achieved 3rd Dan in October 1985. In November 1989, Sa Bom Nim Kachevas became only the seventh woman in the United States to achieve 4th Dan. 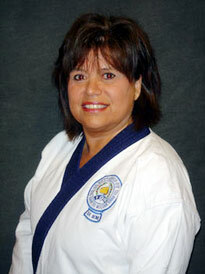 Concurrently, she received her Master Instructor certification through the U.S. Soo Bahk Do Moo Duk Kwan Federation. She was promoted to 5th Dan in December 1994 and 6th Dan in July 2000. Sa Bom Nim Kachevas was honored to successfully test for her 7th Dan in South Korea in November 2008. She is only the third woman in the United States to gain that honor. Whether she is teaching men, women, or children, the focus is on the total development. Sa Bom Nim Kachevas’ students learn more than a martial art. They benefit from lessons that become integrated into their daily lives. The United States Soo Bahk Do Moo Duk Kwan Federation, Inc. is a not-for-profit organization whose purpose is to ensure that students receive high-quality, standardized instruction which adheres to the curriculum of the international World Moo Duk Kwan Association, Inc. Our Soo Bahk Do Moo Duk Kwan Founder, Kwan Jang Nim Hwang Kee, established this national organization to maintain the purity, tradition, and integrity of the martial art we practice. His son, Kwan Jang Nim H.C. Hwang has continued with this goal. As a school, Korean Karate Center is officially registered through the U.S. Soo Bahk Do Moo Duk Kwan Federation as a facility where this martial art may be taught. Instructors and assistant instructors receive Certification through the national organization. One of the certification requirements is to attend to national teaching seminars on a yearly basis. As Moo Duk Kwan students, instructors are also individual members of the U.S. Soo Bahk Do Moo Duk Kwan Federation. As students and members of the Federation, we are required to maintain the membership on a yearly basis. The membership establishes that an individual will be eligible to attend Regional and National events and special seminars and clinics. Membership means that an individual is recognized nationally and internationally as a Soo Bahk Do Moo Duk Kwan practitioner, and rank is registered and will be recognized by any Certified Studio. Federation membership also ensures the legitimacy of the testing process. Upon submitting your membership application and fee, you will receive a Gup Membership card and identification number, a Gup Manual (containing terminology, Korean culture/etiquette, and other information essential to training), as well as a Gup Pin. On a yearly basis, you will be contacted directly by Federation Headquarters to renew your membership.